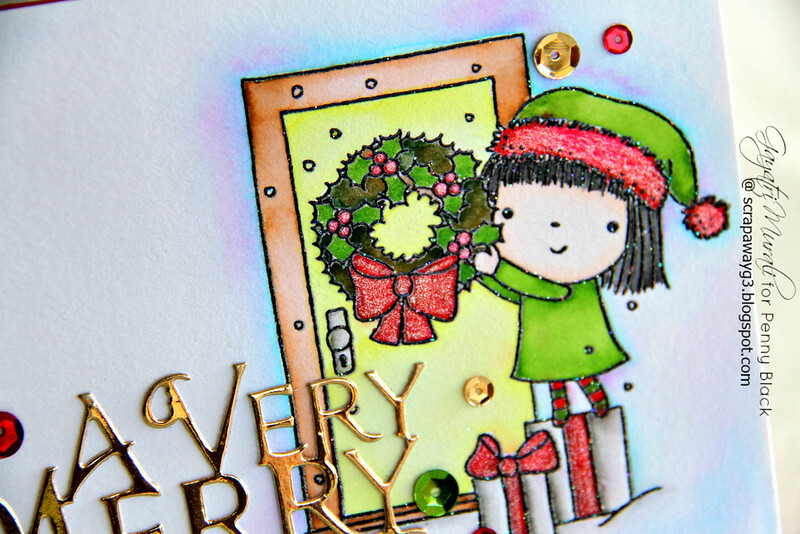 Penny Black – Very Merry Christmas! Hope you are enjoying your Friday! 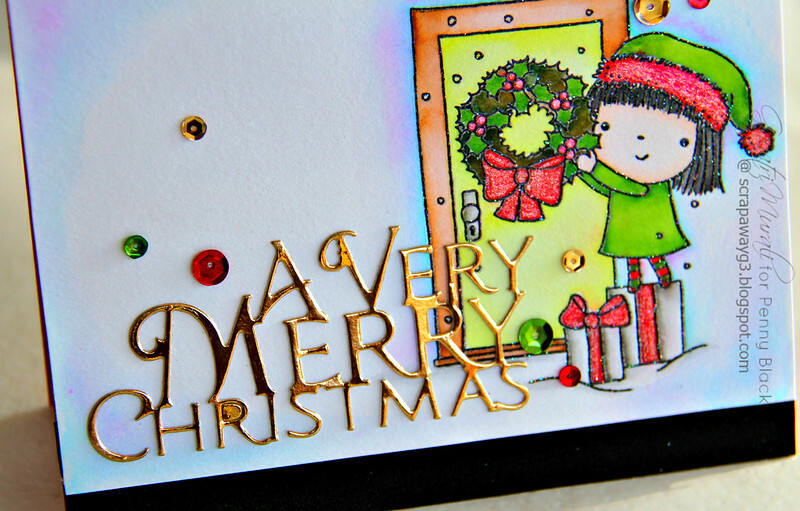 Today I have a Christmas card share using new release products from Penny Black. I am lucky to be part of their Contributor’s Program and thereby able to showcase some of their gorgeous products. I love Twinkle and Wish stamp set from the new release. There are four cute holiday girl images that you can colour. Here is the stamp set for you. I picked the top right image of the girl hanging the wreath on the door image to emboss on watercolour cardstock and colour using Zig Clean Brush watercolour pens. I then used Sakura clear shimmer pen to add shimmer to the reds on the coloured image. You can see the shimmer on the photo below. 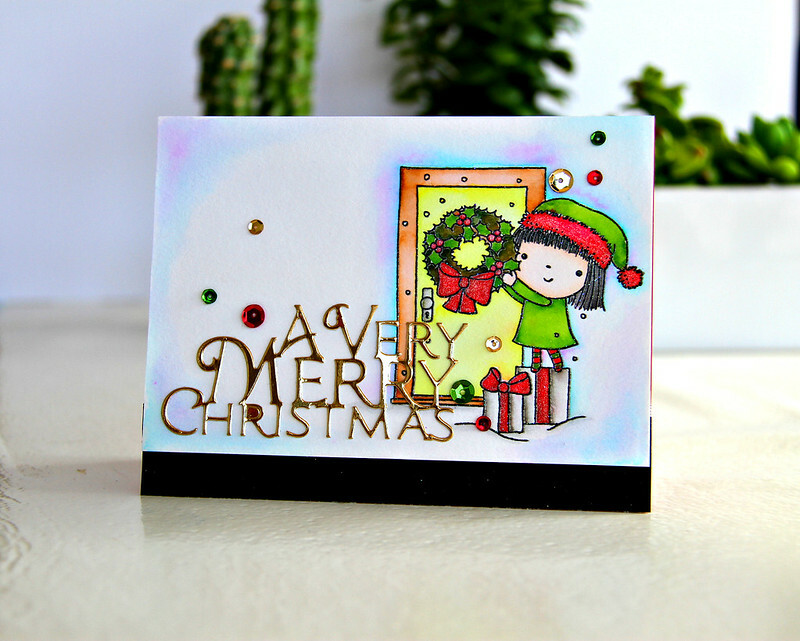 The sentiment is a die called A Very Merry which I die cut using gold foil cardstock. You can purchase all the Penny Black products I have used on my card and many more new products from Penny Black store. So cute Gayatri, your colouring is awesome! So cute! Love this stamp set, and your card is just darling. The sentiment really stands out. Very cute card!! Love the glitter. PB is one of my favorite companies & I totally adore this darling card–beautifully colored & love the gold die cut sentiment!